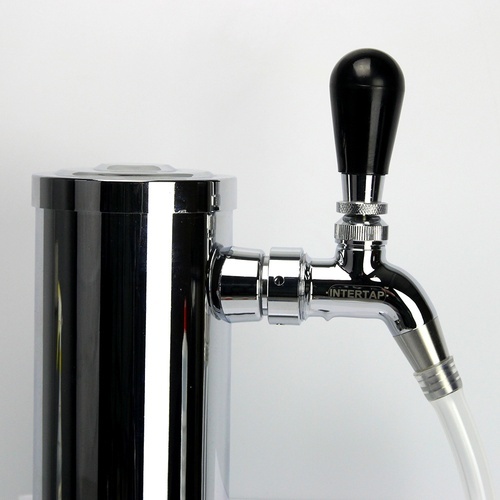 I already have an Intertap faucet that I love, need this to bottle beer. Hope it is better way to fill growlers. I love to growler fill for friends, family and to go when meeting up with my homebrew club. Take my draft beer on the road - why not? Reasons. Mostly growler filling reasons. Thoughtful design and seamless integration with another product. To fill growlers to take to the barn. I don't fill many Growler's so I use this mainly as part of my Draft line cleaning system. I mix up a gallon of LLC (item CL24) in a keg and hook it up to the gas & the tap. 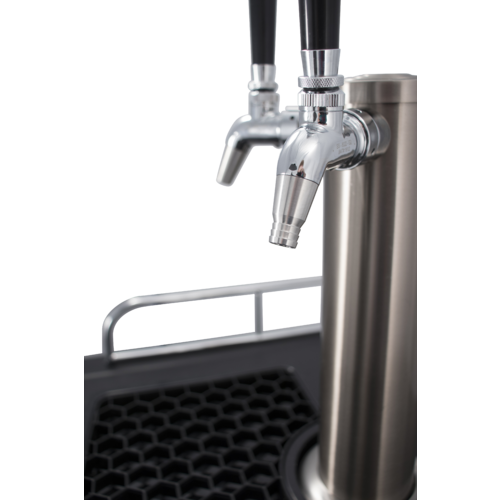 Replace the regular spout with the Growler Filling Spout with a three foot piece of 1/2" tubing attached. Run the tubing into a bucket, open the tap, let a couple of quarts run into the bucket. Close the tap, let it sit about 15 minutes, open tap and let remaining LLC run into bucket. Refill the keg with about four gallons of water and flush everything real well, again letting the water collect in the bucket. While I'm waiting on the LLC to do it's thing, I clean my regular spout. Reassemble regular spout, discard both LLC & rinse water and back in business. Simple, cheap, and effective. 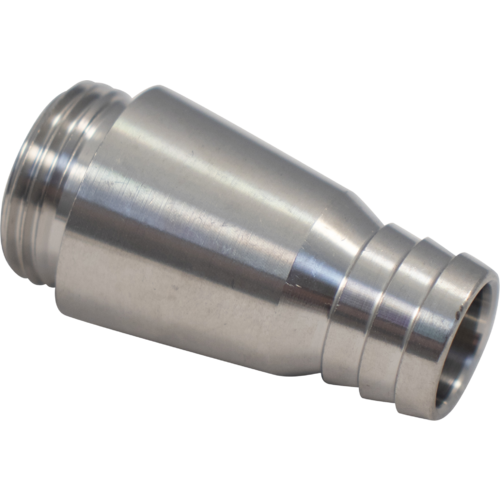 Easy to use, good build quality, fills growlers. These things are great. Love being able to thread a piece of tubing on the tap for growler fill. Ding it one star for being so damn wide. I wish it took a slightly more narrow piece of tubing but that's a minor complaint. This is really intended to aid in filling growlers from a tap? Look at the barbed part of this thing. It's huge! A 5/16 ID tube will not fit on the end of that. Let's take a step back. What's wrong with just filling a growler straight from a tap? Well, you get too much foam. Too much surface area causes the CO2 to come out of solution. So what would a growler filler hopefully do? It would provide enough resistance all the way to the bottom of the growler so that as you fill the beer isn't exposed to low pressure air and doesn't release the CO2. The opening on this is so big that at full open the faucet doesn't fill the entire tube connected to this. That provides tons of surface area for the beer on its way into your growler and causes the CO2 to come out of solution. This thing is completely pointless. What would have worked? 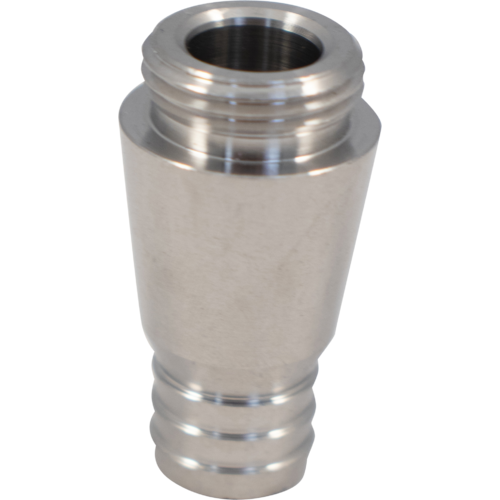 A bard fitting that a 1/4" or 3/16" ID tube would fit on. Seems pretty darn simple. I haven't even pointed out that the growler filler doesn't make a liquid-tight connection to the faucet, so it isn't even suitable for use with properly sized tubing because that would cause it to leak at the threads.